Well-known Chinese sites like Sina and NetEase (via GamesInAsia) are reporting an argument erupted in Guangyuan, Sichuan when a mother discovered that her sixteen year-old son went to a net cafe instead of coming home after his school let him out for a vacation break. As GamesInAsia notes, minors are not supposed to be in net cafes, which are ages 18 and up. Chinese news reports sometimes seem to dramatize stories—especially ones with a strong moral bent. Sometimes stories appear to be complete fabrications. According to Sina (via GamesInAsia), the mother yelled, "You go online and I can't control you, so I'll just go die!" NetEase (also via GamesInAsia) quotes her as saying, "You're playing online games; I didn't teach you well, I can't live with myself, so I'll just go jump in the river." However, GamesInAsia notes that both Sina and NetEase could be paraphrasing, though the quotes are presented as if they are word for word. 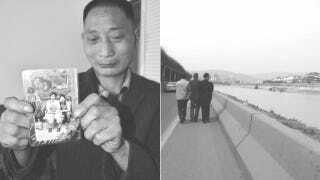 The mother phoned her husband (pictured above) when she and the son ended up on the banks of the Jialing river. The mother apparently took a few steps in and was supposedly caught by an undercurrent and swept away. Unfortunately, her son wasn't able to save her. When the father arrived, people watching told him that his wife had jumped in. He got angry at his son, kicking him and saying (via GamesInAsia), "You had to go online, you had to play games!" The son, it seems, then jumped into the rushing water. According to Chinese reports, both the mother and the son have been missing since April 4, and their bodies haven't been recovered. If this sad story is true, it's believed the two drowned.